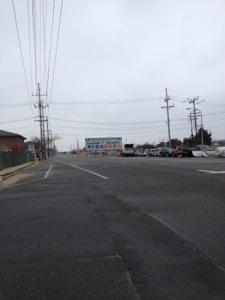 Today the kids and I took a little road trip (19 miles) down the coast to Seaside Heights. 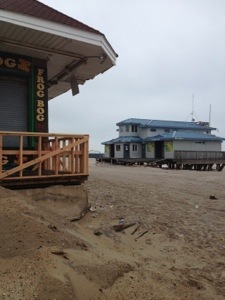 Seaside Heights is a very popular Jersey Shore destination with an awesome boardwalk and amusement park. During Hurricane Sandy it became famous by having it’s roller coaster washed out into the sea. We wanted to see it. 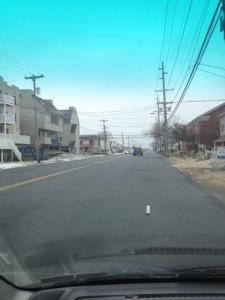 As we were travelling down the shore road we saw many roads roped off and police officers everywhere. There are signs that say “No Stopping” and “No trespassing”. There is a 25 mph minimum speed limit, meaning that if you are a gawker, you could get a ticket. As we got closer we were amazed at the destruction. Hundreds and hundreds of homes ripped off their foundation and laying on their sides. 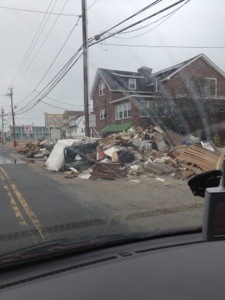 It is amazing to see a 2 or 3 million dollar home lying on it’s side with the contents spilling out. There is construction going on everywhere you look. Everywhere are signs warning against looters and police officers at every turn. 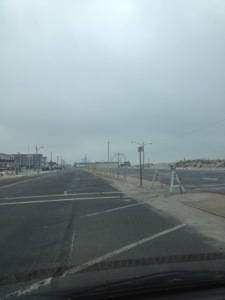 We were able to find an open road leading up to the ocean where we got a quick glimpse of the coaster. But otherwise, we were not allowed to get any closer. 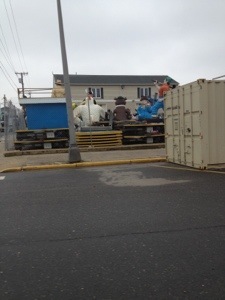 The boardwalk stores have been gutted and their contents piled high in the streets. It is really an amazing and awe inspiring sight. It reminded me that so much can change in an instance. That we tend to put so much time and energy into our stuff. But it can be gone in one storm. Being a nomad/nopad is teaching me that I can do without ALOT! I don’t need 10 pairs of jeans and 20 pairs of shoes. I really can get along without a 4200 square foot house. All we really need is each other and the rest is just gravy. We are blessed to be experiencing this homeless adventure and learning so much. Thank you Lord for this precious unique time and blessings to those still fighting the storm. Thank you Ann for your posts, I am appreciative and enjoying them. Love you all!